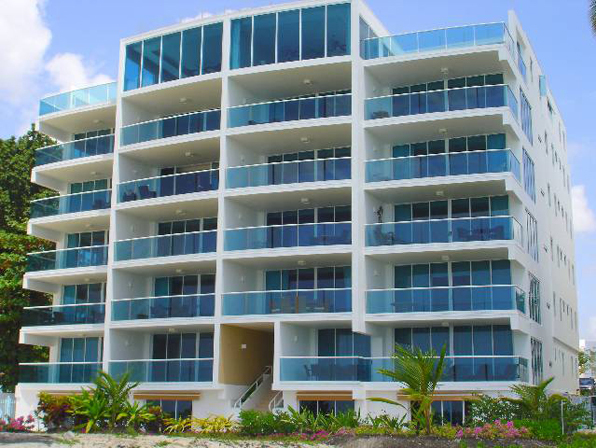 21 Luxury beachfront apartment development featuring 2 and 3 bedroom condos (two 3 bedroom penthouse suites), nestled on one of the best south coast beaches where the water and sand is simply beautiful and very clean. The location of Ocean One is very convenient as the airport is just a few minutes away and all popular amenities (restaurants, banks, gas stations, supermarkets, golf facilities, water sports etc.) are also measured as being just minutes away. Ocean One development built with concrete sleek structure and contemporary glass features. A multi level pool and Jacuzzi will be nestled on the beach side of the complex, elevator access to all condos, secure entrances which will be controlled by a security system, a two storey fully equipped gym with free weights and cardio equipment, professional landscaped garden areas. Other features included are… reception & welcome area, locked storage facility in basement for each owner, car park with one space per owner and stylish pool deck furniture and pool/beach loungers.